Pioneers definitely fall into my homesteading review week as they had to use only things they grew to cook, no local grocery for them to run and pick up some frozen pizzas for dinner! 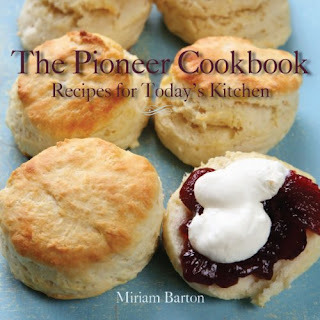 When I saw this cookbook was out I sent to the publisher Leatherwood Press, asking for a review copy. I knew it would be right up my alley! I love reviewing books that I am excited about without even seeing them first! I first noticed a recipe for Machaca which I recently had a friend of Mexican heritage tell me about for using up some of my roasts. A great recipe for basically making a tender shredded beef to use in other recipes. Pasties or meat pies are in the main dishes, something the upper Michigan folks know much about. Chicken dishes, even seafood, though I do question the recipe for boiled lobster, I am thinking the good ole pioneers didn’t get too much lobster come their way. Interesting recipes that the pioneers used and perhaps some current day homesteader would try like Baked Rabbit and Roasted Duck. The recipe for Roasted Raccoon I could do without. Those varmints each my chickens and I don’t think I could roast and eat them. As typical of cookbooks we have our main dishes, soups and stews, sauces and dressings, side dishes, breads and biscuits, desserts, and candies and drinks. I love the section on food preservation, great idea for a pioneer cookbook. It even has a small section on self-care and remedies for your basics. I will soon be getting some whole wheat berries so I can grind my own flour and try some of these hearty bread recipes. I had hoped to do that before my review so I could post pictures, but you will just have to stay tuned! Bread was sure a staple food for the pioneers. There is reminiscent clip art throughout, and fun little pioneer sayings and poems. It has a definite pioneer feel to it. There aren’t any photographs, I know you wanted to see the Roasted Raccoon, I did too. A few here and there would have been fun if the background was pioneer/rustic like. Overall I really enjoyed this book. I know a lot of recipes can be found online now, but that just doesn’t give the cook the same feel as having a good ole cookbook in hand! Thanks to Leatherwood Press for allowing me to review this book. Yeah, I feel silly cooking with my laptop open on the counter to an online recipe. Someone at my publisher's office sent me this link to check out one of my book reviews. Thanks for the nice things that you said (and between you and me I'm not a huge fan of roasted raccoon either *wink*). It was a fun book to write and research for. A couple of my personal favorites in the book are the sourdough pancakes and the bignets (just for starters). Lots of luck with the recipes! I love cookbooks. You are right, the internet just isn't the same. This one sounds great! Fun - maybe I'll have to snare me a raccoon and give it a try!